In addition to the weekly Tuesday polo, Thursday Thames and Sunday pool sessions, we organise regular trips and social events throughout the year. 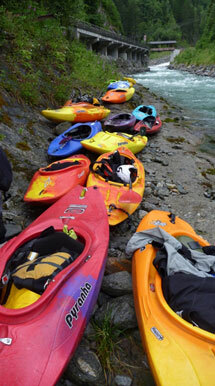 There is usually at least one flat water paddle every couple of months, some surf trips around the spring and autumn months, river trips throughout the rainy seasons and trips to artificial white water courses throughout the year. Large canoe polo competitions run during the summer months and the National Canoe Polo Leagues run during the winter months. We usually have a couple of large social events, (e.g. summer BBQ and Christmas Party), as well as ad hoc get togethers. Most years we run a ski trip during the winter months. The main event of the year is usually the club trip to the Alps in the summer to do some river running in the sun! Our club e-mail distribution list is the main way to communicate events to members. Events are also listed in the calendar below. Members are encouraged to organise events. More experienced members are usually very willing to help and give guidance to the lesser experienced members wanting to organise a trip. See the calendar below for planned trips and social events. You can subscribe to the club calendar, which means that you can keep your own calendar on your phone or PC up to date with all the Battersea Canoe Club events. Once you are subscribed to the club calendar all changes to it will be updated automatically on your own phone or PC. Update/Subscribe to the club calendar shows details of how to do this and also how to get permission to add events to the club calendar. Click on an event shown on the calendar below for more details.